Watford plan to commission a statue of former manager Graham Taylor which will stand at the club's Vicarage Road stadium. Watford will honour former manager Graham Taylor with a statue at Vicarage Road and host an annual pre-season game as a mark of respect. Taylor, who died last month aged 72, enjoyed two spells in charge of the Hornets, taking the club from the old Fourth Division to the top flight as well as the 1984 FA Cup final while he also guided them back into the Premier League in 1999. 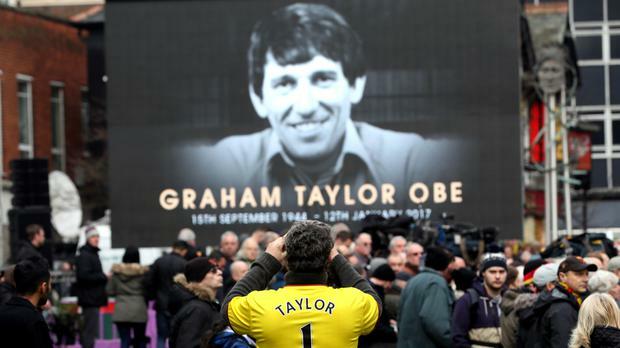 Watford will now work with the Taylor family and supporters' groups to secure a lasting memorial for the former England manager. A club statement read: " With the blessing of Graham Taylor's family, Watford FC will move forward with two significant tributes to the late Graham Taylor OBE. "In addition, a pre-season tribute fixture - which is expected to become an annual opportunity to remember Watford's greatest-ever manager - will be arranged to take place at Vicarage Road Stadium ahead of the Hornets' 2017/18 campaign. "Watford FC is pleased to confirm that it will engage with fans' representatives to ensure that supporters play a lead role alongside the club in bringing the statue to life. Again, Graham's family are very supportive of these actions. "Further details about both tributes will be published as soon as they are confirmed."